Hey all, new poster to the forums here (been lurking now and again though) and new player/ZM to the EotW system (aren't we all? ), BUT I'm also one of those multi-decade gamers who knows he would like to see just a bit more crunch in his zombie apocalypse system than what EotW provides vanilla, so I want to talk about it here with you folks who have more experience with the system. If this doesn’t interest you (i.e. if you don’t see yourself providing input that is constructive towards crunching some crackling-numbery-goodness), then please kindly don’t involve yourself in this discussion. Crunch is something that I and my table enjoy and indeed expect, and if you don’t – that’s cool – just don’t waste your (and my) time to come in this thread saying that it’s unnecessary and what not – I know it’s not – but it IS fun (for us). So if your table is like mine, or you’re just curious about exploring the considerations that follow with a positive, open mind - then please give the following a read (I know it’s pretty long… sorry!) and stick around to have a chat. A brief primer: I plan on running my EotW campaign in the Last of Us universe. Accordingly, I’m going to use Cordyceps/Infected/“Clicker” zombies – which I have yet to stat-up, and I want it to be a long term (pre, during and post-apocalypse), grand-in-scope campaign. Also, worth noting; I plan on encouraging my players to play a more fictionalized or perhaps a prior version of themselves. I will not incorporate the most immediate of loved-ones from their real/present life like their wives, husbands or children (or pets) into the game - they simply won’t exist in my campaign universe – as I anticipate it would (and several anecdotes I've read from actual sessions/ZMs support that it does) just distract from what I would prefer the game to be about – dynamic survival choices and dynamic story progression. Towards that (long-term, grand-scale) campaign goal, I really just want to add some more meat and structure to what is a very bare-bones rule-set. I’m not trying to introduce any new dice mechanics – indeed, most of what I’ve done so far is just come up with some pre-defined rules, rolls and guidance for standard survival-scenario considerations that I feel the base setting neglected. I’ve also created and re-engineered various bits of gear, including weapons, and am working on … improving … the Features system in regards to mechanical progression. Most (or really, all) of this could be used independent of a Last of Us-styled campaign, of course, so please think/talk about this stuff (and use it, if you want) in the context of your own game! Starting Gear purchase point system – I didn’t like the “whatever you have on you” thing for a number of reasons… I'm pretty excited about the potential of what I’ve developed. Capacity/Encumbrance system – I want the choices a player makes regarding their carried gear to be a defined and important commodity, and something with a mechanical progression too. Survival Check mechanic – A single roll the players can make covering an entire day – perhaps used for downtime, traveling or while waiting to heal Traumas, etc. Refined/Expanded Weapons – I found weapons, especially firearms, to be poorly balanced and inconsistent in their own implementation as a reflection of actual firearm properties. Refined/Expanded Gear – To accommodate my Encumbrance and Starvation systems, but also to broaden options across various play-styles, and for a distinct Gear progression. A more robust Features System for a more defined player progression mechanic. Unique Features and Stats for Runner, Stalker, Clicker and Bloater infected/zombies. I don't think anything I've done so far (or even intend to do) is that drastic, as I said it’s mostly just developing structure and guidance in advance for rolls/issues that I anticipate coming up or wanting/needing to do. And I wouldn’t use any of this if everyone at my table weren’t experienced gamers who I know can not only handle these types of additions, but want them. I will detail the individual rule-sets in following posts. Not only is the vanilla method able to be manipulated in a ridiculous fashion (I game with the sort of jokers that – since they know the “you start with what’s on you” rule – they would come to the session with their hockey gear, hand-me-down hunting rifle, and camping hatchet), it is also rather boring and not particularly fun, IMHO. Not to mention if you start in someone’s house as per vanilla, it’s completely irrelevant as they can probably just stock up and arm themselves immediately anyway. And if you don’t start in someone’s house it could be quite restrictive to game play, and again, I don’t think it ever increases the “fun level”. Accordingly, I have assigned a point value to each item in my expanded/revised Common Gear table. The values range from 1 to 5. The players get 5 points to “spend” as they wish to determine what gear they will start with. I think it works out pretty well. Let me know what you think. Try to break it, etc. A side benefit of the purchase point system is you could conceivably also use the values as a loose guide for bartering interactions in-game. Though you should, of course, always use your discretion as ZM for what is appropriate. 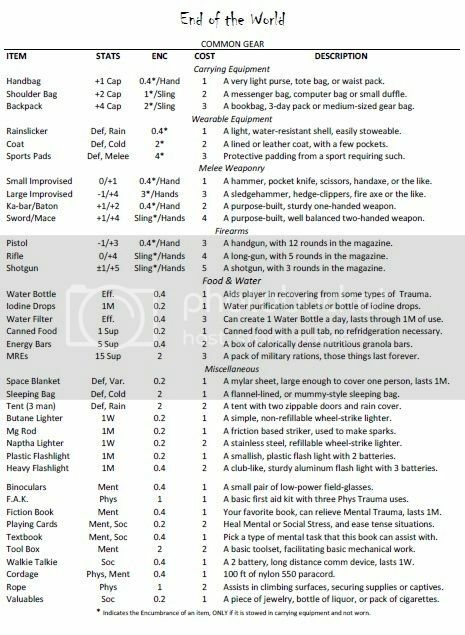 In the interest of avoiding situations where a player is going to haggle with me over what they have on them and what they can carry (or at least to minimize the haggling), I decided to come up with a carrying capacity and encumbrance system. My system is an abstraction of weight and volume and wieldly-ness all rolled into one, and it is designed to be fairly restrictive, as I want a player’s capacity and encumbrance to be elements that have a mechanical progression that lends a noticeable advantage. First, a player has three “slots” (i.e. locations) where items can be practically and comfortably carried or equipped – this will in part determine their Encumbrance. There are two Hand slots and one Sling slot. If those three slots are occupied, and a player chooses to carry Gear that requires another slot, then they are going to be encumbered. So, say a PC has a flashlight, pistol and backpack equipped, but also chooses to carry a large improvised weapon on them – they are Encumbered and, as a result, add at least 1 negative die to their tests as would be appropriate for someone who is Encumbered (i.e. when running or climbing, even in melee combat, etc. ), but they could have to add more negative die as determined by ZM discretion (perhaps jumping or swimming while encumbered warrants 2 negative die?). Gear that is worn (clothes, jackets/coats, and protective equipment) should just be reckoned with common sense and ZM discretion. For instance, you probably shouldn’t be able to wear more than one substantial layer on top of your clothes without being encumbered. For example, wearing protective sports gear in addition to a coat would reasonably encumber you, but a simple bullet proof vest in addition to a coat would not. It is also up to ZM discretion as to how many additional slots a player is allowed to carry/equip gear to beyond their base number of encumbrance slots. I would recommend no more than one additional Hand and Sling slot. So, a person without specialized gear can carry at most three Hand slot items, and two Sling slot items – and would be encumbered while doing so. The third Hand slot would be securing the item to your belt or stuffing it in the back of your pants or the like… the second Sling would be carrying items over both shoulders. Second, there is Capacity; Gear that can be carried at Encumbrance slots (handbags, backpacks, etc.) or worn (pants, coat, drop-leg holster, load-bearing chest rig, etc. ), that have Capacity and will allow a player to carry more Gear than that slot normally would. The Capacity of Gear (or your Hands) is tracked in whole numbers of Encumbrance (Enc - 1, 2, 3, etc.) and decimal places (even number intervals only, Enc - 0.2, 0.4, etc.). Worn Gear with a few pockets (i.e. pants, jacket/coat) has a 0.4 Capacity – so a player starts with their three slots, plus 0.4 Capacity in their jeans – any additional Capacity will have to come from purchased Gear. A Hand slot can generally carry only one item which generally shouldn’t exceed 1 Enc (if a player wants to carry an item larger than that in a single Hand slot, consider giving them the encumbered penalty – remember this is an abstraction of how what you’re carrying effects your ability to move – balance, speed, all of that), a Sling slot has no Capacity of its own, it is only able to carry an item with a Sling Enc value. This includes items like backpacks that take up the Sling slot, but which then has a Capacity of its own. If a player exceeds his total Capacity (don’t worry about managing each container’s Capacity rating separately – it’s a part of the abstraction), he becomes encumbered just the same as if he ran out of slots. All items are assigned an Enc value that includes the amount of Capacity they take up, and will also include the slot required to carry it if the player is lacking Gear with enough available Capacity. I feel like that all sounds more complicated than it should, it’s really not, just trying to describe it in text is awkward. Anyway, let me know your thoughts. How to improve, how it could be broken, etc. The players track an abstracted commodity called “Supplies”. A player consumes Supplies at a rate of one per day. If a player runs out of supplies, they can go one day without ill effect. If the player begins a second day with no Supplies, they begin to starve and take one Physical Stress – unresisted (Resistance does not negate Starvation Stress) – that day, and every day after that in which they wake up without Supplies. A Trauma that is converted from Starvation Stress cannot even be attempted to be healed until the player has Supplies again. I am not going to require players to track their Sleep (or more accurately; sleep deprivation), because I don’t anticipate it coming up that often – or for very long stretches, but for every 24 hrs a player goes without sleep they take one Mental Stress – unresisted (Resistance does not negate Sleep Stress). Trauma converted from Sleep Stress may be healed normally. Not every day in-game is spent killing zombies, evading raiders, and trying to save the world. Sometimes you just need to lay low and try to get by, perhaps until the time when that broadcast you managed to pick up said a Red Cross helicopter would be landing? Or maybe you’re making a multi-day trek across an urban landscape that doesn’t bear RPing out bit-by-bit? Or maybe you, after a mostly successful scavenge of an airport hangar, really need to recover at base-camp from a few Traumas before taking any more risks. For times like these, I wanted to have a single test that could represent a player’s specific approach and the attempt to get by. A Survival Test may be attempted with any of the three offensive Attributes; Dexterity could be a hunting and gathering expedition, Logic might represent the careful locating and search of a promising source, and Charisma could represent begging or conning others for supplies. The test has a base difficulty of 1, and if it succeeds the player generates 1 Supply. The test receives positive and negative dice modifiers from Features, Trauma, Equipment and the Environment/Situation as normal, and may also cause Stress as normal (and is subject to Resistance as normal). Some areas/environments may be easier (a secluded forest) OR harder (a city-center full of undead) to survive in, but this may even change based on the Attribute (Physical, Mental, Social) relied upon to get by. For instance, trying to use your Charisma to get by in a secluded forest could be difficult as there’s no one else around to charm, this would accordingly add a negative die to the test. Trying to survive using your Dexterity in a region with a large raider camp nearby could be quite dangerous and could therefore add a negative die. Additional Successes generated on the Survival Test produce 1 additional Supply. Paired successes result in a non-Supply item being found as well (roll from the “Dwelling Scavenge” table). All of the new and refined Common Gear you can find in the Starting Gear section... I am developing extended descriptions, as some items have more functions than could be listed or described in the table. And here are some bonus Random Loot tables!! Again, please let me know your (productive) thoughts and ideas, and I look forward to your input, cheers! I am an unapologetic low crunch guy. That said I think your house rules crunch makes sense and I could see myself using it in games. Your encumberance rules seem logical and avoid the "I have X points so I can carry Y gear" problem. Such as a player wanting to carry a shovel, a shotgun, three knives, and a flashlight, all "ready" for use, without slings and straps. Slots is a great way to do encumbrance. i also really like the idea of a "survival check" to abstract periods when it doesn't serve the game to role-play in detail. Heh heh. I'd love jokers like this. There is no haggling. Wanna encumber yourself? You'll be dealing with one or more negative dice on your physical checks. I don't need lots of rules for stuff like this. The game and its mechanics are very mutable. Also, very few if any of my friends keep weapons or anything similar beyond tools at their homes. The one friend I have does train broadsword but he is the only one. We game at my place which is very close to a mall (clothes and other sundries), and Canadian Tire hardware store (firearms, camping equipment, tools), and a grocery store. Personally I think you may be trying to over complicate things, but if you and your friends enjoy that, go for it. Couple of questions though, specifically about the stats of your equipment. The weapon stats mean what? A pistol has -1/+3. Is that one negative die and a +3 to damage? Because the book has it as one positive die and +3 to damage. Or are you changing things for your own game? Same with the shotgun and rifle. What do 1W or 1M mean in the stat lines? Or did I somehow miss this explanation? Oh don't get me wrong, I love my group and the stuff they pull, but I do not like the starting gear rules. They are lame. And again, I'm not going to debate the necessity of my hombrew rules and the irrelevancy of your individual experience/situation, especially as that relates to them. But thanks for the permission I didn't need or seek. - As I mentioned in my first post, I restatted the weapons because they were poorly done - as a conceptualization of the real thing and as a mechanical progression. And again, not interested in what you think about the restatting - it's what I'm gonna use (in addition to a weapon-mods system that is a part of my Advanced Gear). - Just as with Traumas 1D, W and M mean 1 day, week and month. Those are consumable goods. Lighters don't last for ever, and eventually you'll read through your book, etc. Again, I have made the consumability of items into part of their mechanical value/advantage/progression. But thanks for the permission I didn't need or seek. I was planning to make some rules additions along the lines of what you are purposing so I'm glad to see your take on things. I had been thinking of tying starting equipment to the features players might take. So someone who takes a woodsman/ hunter feature starts with a hunting rifle. I really like your idea for a survival check because as you say sometimes a more abstract system for seeing how well characters are surviving would be good, especially while healing up. Your sleep and starvation rules are probably my favourite of your additions and I will likely use those rules myself as is. I'm looking forward to seeing what else you come up with. Hey all, I have added an (in-progress) "Advanced Gear" table to the "REFINED/EXPANDED GEAR & WEAPONS" section as well as a bonus peek at my beta Random Loot Generation tables! I like your idea of pairing equipment with Features - I think it would work especially well for a campaign where the players aren't playing themselves or perhaps to generate "pre-gen" character for players who can't or don't want to make their own. Really, you could still use the purchase point system as a guide to keep different "Archetypes" balanced between each other. My reasoning being that I feel like it will allow the players to manage their "health" a little more fluidly. Pretty cool ideas. I don't think the stress management thing will mess anything up as long as you play it that way right from the start. The players won't notice the difference. I'm planing on having stress work a little different in my game too- I'm not going to let stress from a single source overflow into the next higher tier. And secondly instead of the "cling to life" rule I'm going to say you are still alive when all 9 stress boxes are filled but if you take even a single point more you will die. I really like those ideas for levelling up. It's cool to give characters some options. Those options need snappy names, like for physical: 1-Powerhouse, 2- Rage, 3- Deliberate. Have you ever played the video game State of Decay? What you propose for levelling up reminds me of how it works in that game. I did actually have some names at first (Expert Hand, Strategic Sacrifice, and Calculated Risk), but fealt like they didn't work unanimously across the context of the different attributes Features, and didn't want to come up with 9 variants Still might be nice for the flavors sake I guess. I'm surprised you're looking to make death more likely in your game, but that's probably because I always think of things in the context of wanting to have a long term campaign. In fact, as a way to prolong the point to where you have to Cling to Life, I'm considering allowing players to, instead of dieing upon exceeding 3 Traumas, instead allowing the upgrading of Traumas if possible. So, say a player has 3, 1D Traumas. If they decide to take another 1D Trauma, instead of going through the death rolls, they may upgrade one 1D Trauma they already have by 1 severity increment to a 1W Trauma. If they later converted a 1W Trauma they could upgrade another 1D to a 1M (so, 2 severity increments). But if they got in a pickle and took a 1M Trauma, they have no open "Trauma slots" and there is no 4th tier of Traumas so they can't upgrade any others, so then they would die. Well I wasn't intending to make it more lethal actually. The stress not overflowing into the next higher tier would, I think, make characters last a lot longer. And the still alive while all three stress tracks are full would effectively give a character 3 points of resistance for their final hit point. I thought cling to life would make characters be able to survive too easily with the alternate rules I'm thinking of implementing. I like the upgrading the severity of traumas you describe. It seems like it would be an easy and intuitive thing to do and makes a lot of sense in the context of the game I think, with injuries getting more serious. Good stuff. I'd love to read a play report once you get around to playing. Just to see how well your homebrew stuff works. No, you're right about survivability, I was focusing on the elimination of Cling to Life but in the context of a greater mechanic I think I can see what you're going for and that Stress "hurdle" approach would lend well to survivability. And I'll mos def put up some in-play analyses of my houserules once were a couple sessions in. But we only play weekly and just started into our Pathfinder campaign rotation (we rotate through 3 or 4 systems/GMs, playing 1 for 6 - 8 weeks before its on to the next) so it will be awhile before EotW is up. Still human in appearance, the victim is already on the fungus' "life-support", as it works quickly to supplant and hi-jack the nervous system. The host is mentally and visually impaired by the rapid spread of the fungus, however, at the same time their hearing and the trasmission of somatic neuro-signals is enhanced. They are prone to violent outbreaks, emerging immediately from their troubled-yet-inward-focused state... they will come straight at you, as fast as they can, with a terrible wail. By now the fungus has fed heavily on the internal organs, weakening the body, and is often beginning to protrude through fissures in the cranium, coating the gums and ringing the finger and toenails. Completely in control of the host by now, the fungus utilizes the most basic of what remains of the animalistic reflexes to keep it's vessel intact. As a result the creature can appear intelligent, trying to hide from and surprise potential pray with attacks from the silent dark, a rasping croak it's battle cry. The union of fungus and host is complete and the living-dead creature is completely blind. Fungal protrusions have become the dominant feature of the head and body, which it uses with an adept sense of echolocation, and those vestigial animal instincts honed to a fine edge. The creature feels nothing, requiring destruction of the cranium to stop. The fungus has now enhanced the host body, turning it into a killing machine. The stocatto, sonic-pulses constantly searching out the next victim. Good stuff. The Last of Us is one of my favourite things ever. The only thing I would say is that maybe the runners and clickers should get a negative feature about making noise, since in the game you often hear them before you see them and you can use listen mode to detect them. How are you planning for them to pass on the infection in game terms? Something like the 2 uncanceled 6s causing a critical and thus exposing the target to infection? How long after the outbreak are you setting it? I'm super curious about how this goes. Could be a really interesting game, the source material is so great. Agreed! Best game I had played in a long time when I got my hands on it. Father-son/daughter stuff gets me, and I'm not too proud to admit I teared-up at the beginning... and the end. The only thing I would say is that maybe the runners and clickers should get a negative feature about making noise, since in the game you often hear them before you see them and you can use listen mode to detect them. 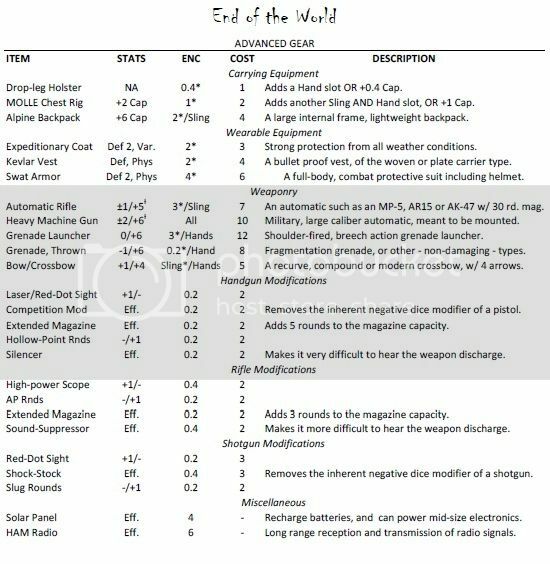 Regarding the timeline, I'm planning on starting the game immediately pre-Outbreak (at a "Zombie-Con" convention), and do some tutorial like encounters in that context - gonna be pretty light-hearted at first (as I mentioned, my group is a bunch of jokers and I thought it'd be fun to use the 'Con to keep 'em guessing when and how the real zombies would emerge). Then have it progress through the night of the the Outbreak ("Jeez, those cosplayers are really good!") and play through maybe a week to a month of that (depending on what and how they do things) just depict how quickly and how eff-ed up things get, then skip ahead maybe 10 years. Loving your stuff here. 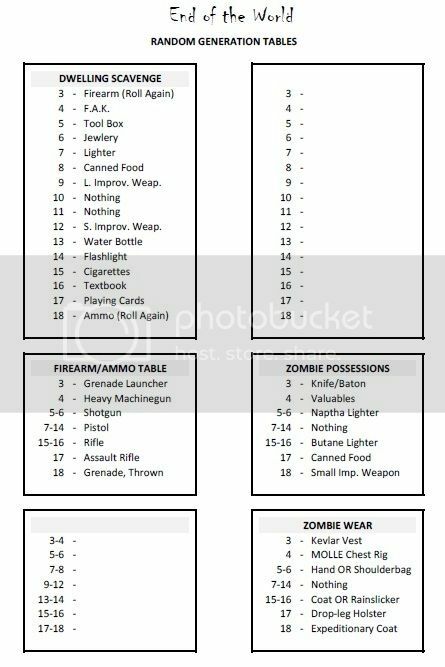 My question might be a little daft, but in the statistics for your zombies/infected you have "Def 1/Def 2/etc"... what do you mean by those? Hi Soldier, thanks for the support. The Def annotation is short for "Defense" and a result of me trying to cram as much info in as little a space as I can and so is a lot of this is probably quite cryptic to anyone who isn't rolling around in my mind along with my ideas for this stuff, but it means essentially they have a "Resistance" like mechanic for the Stress/Trauma source listed after it. So, Def X - Cold would be X points of Resistance to any Stress from cold/freezing conditions. In retrospect such a notation probably isn't necessary for the Infected (and I really don't don't know how much I'll use weather-related Stress on my players even), but it was mostly a way to remind myself that those Infected don't care about the weather and can therefore be anywhere, anytime, whereas the Runners still have enough "human vulnerability" that they may avoid the outdoors in winter. I start my GM rotation in two weeks and will finally get to test all this stuff out, and will likely end up revising many things. Def X - Melee, means the creature has X points of Resistance to Melee induced Stress, and Def X - Phys means they have that many points of Resistance to any Physically induced Stress. Which now that I think about it would mean they'd never tire from running or be hurt by short to moderate falls, or other various potential Physical actions, so I may have to revisit that but it is meant to make them more resilient in combat. Ah, that makes sense. Thanks! Do you mind if I use these stats in my own EotW game set in The Last of Us's universe? I love the game, but haven't been able to settle on any specific set of stats until now. No, not at all, use any of it that you like. Just mention that you got it from some super awesome and really handsome guy on the FFG forums. I don't have enough thumbs up to express how good this material is. So, it finally happened. After waiting and planning scenarios a couple months on end, my turn came up in our GM rotation and I finally got to run EotW! It was a couple weeks ago now, and I just now got around to typing this up, but I'll start with a little walkthrough of the action (it’s really long, sorry). Things started with the group meeting up in my city's downtown area - a pedestrian mall (they did play themselves but we did not start at the gaming table as the book suggests... when I started planning all this, we were playing at my house and I'm a bit of a "prepper" so I didn't want to make it "too easy"). The premise being, one of the players had won a set of tickets to the "’Con of the Living Dead" (a vampire, zombie, mummy, etc. focused covnention - comics, moview, games, shows, all that), as well as a two night stay at a nearby hotel, on a call-in radio show. Right off the bat they come upon a "Zombie Run" (which I used as a tutorial for the system), associated with the ‘Con, taking place on the pedestrian mall. My players picked up on the system pretty well and each used different tactics based on their strengths to try and navigate the run (which bore the potential for a reward for navigating without getting “caught” by a “zombie”). The pools are small, and no one is that succesful (2 successes required for a "big" prize), one failing outright, the other two with just 1 hit (they score bottles of water), all take 1 or 2 Stress. One guy went directly to the Con and used his LOG to comb through the stacks and find an issue of his favorite comic (I told them how they could use books to heal Mental Stress, while explaining the system). I also had a couple more Events (Undead Trivia Contest and a Panel Discussion w/ creators of the new videogame "Guess what? It's more zombies!") at the Con as more tutorials for the various (Metnal and Social, respectively) conflict types, and as other chances to win minor items, which they took part in and a couple guys earn more small prizes and a bit more Stress. They also saw some of the attractions, cosplayers (zombie-Slave Leia, Optimus zombie-Prime, etc. ), celebrity guests (the cast of "Late Afternoon" - the Twilight prequel, the writers of "Law & Order: Undead Victims Unit", etc. ), and some items from the new Ronco line of Apocalypse tools (the Rake-chete’, the Pocket Chainsaw, and the Salad/Brain-Shooter), as seen on TV. As you may be noticing, I did not set too serious of a tone… but I also don’t have too serious of a table. After that was all done, the group heard a commotion off towards the entry/exit to the exhibition area. They weren’t concerned at all, as there were regular announcements and commotions when panelists and celebrity guests would arrive. A couple of them went to look for more swag and zombie-themed products, a couple went to one of the Panel discussions (for “Late Afternoon”, with the intent to heckle). The two who went to the panel were near the entry way and soon could tell the commotion was growing, as several people including the panelists, went to get a view of what’s going on they could see a few fist fights seemed to have broken out over near the medical tent. They stopped long enough to record some of the action on their cell phones and started to leave. As they turned to go, outright screams erupted and some people closest to the action started fleeing for the exits. This started a bit more of a commotion and the pair turned to see what the big deal was. They saw a body prone on the ground in a pool of blood and a “really well-done” zombie cosplayer running at them. Unsure of what the deal was with the stunt, one of the two reacted just in time to defend himself as the zombie slammed into him brutally attacking, they both take some Stress and the other player (a military vet), with the intent of just “getting the guy’s attention” attacks with his pocket knife and scores paired successes. … Drops the zombie with a “lucky” head-shot. It was perfect, because at this time they still believed them to be humans. At this point things go absolutely bonkers, the two players both take some Mental Stress and stare stunned at the “dude” they just killed, and people around them panic and flee in all directions from the violence, screaming. Pandemonium. One player calls 911 as they both decide it’s best to wait at the scene for Police to arrive, it was an accident, they were defending themselves, fleeing would just make things worse, the other goes and checks on the victim the “dude” left bloody on the floor. The two players out on the exhibition floor notice the escalation of the commotion and call the other two to find out what’s going on. They go to meet up with the two waiting for the police. On the way there they pass by the main exit and see people are getting trampled, fighting, screaming, and as they reach the other two, gunshots erupt from the exit area. They can’t see what happened, but shortly after waves of people are running the other direction, they take some Stress avoiding getting trampled (one player does get trampled taking significant Physical Stress – has 2 Resistance now) and once the dust has cleared they see a fire has started somehow on the exhibition floor. At this point they decide it’s okay, and high time to leave the building, but still wait for police outside. One of the players with a Good Memory feature remembers seeing staff using a back exit, and with all the other exits crushed with throngs of panicked people, they head for the back exit. On the way there, they swing by the Pocket Chainsaw booth and engage in an extended Social conflict, which turns a little physical, before leaving with it and the Rake-chete – as well as the two Ronco employees. It’s a service stair well that takes them to the ground floor, which is basically a maze of conference rooms. The moment they open the door to that floor, the fire alarm starts buzzing and sprinklers spraying, all lights go out. One play clicks on his cheap flashlight he won in a contest and they look around. They see a group of “people” acting really strangely (stumbling around, flail mindlessly at the glass when they notice the players inside, etc.) outside the nearest exit, and decide it’s best to find another way out. They go down a hall and decide to use the pocket chainsaw to bust out a large window and get out. Police are setting up a roadblock nearby and shoo the players away, telling them to go home, there’s a riot developing. The Ronco employees make a struggle for their products and getaway with the Rake-chete’. They decide it’s best to get out of downtown so they head to the Hotel where the only one of them who drove is parked. They come upon some “guys” stumbling around in the parking garage and are attacked they use the chainsaw and a couple other improvised weapons they’ve picked up by now to beat them down. Everyone’s taken more Stress by now between the Ronco struggle and this, and they’re determined to get out of here, even when they’ve found the parking garage has shut it’s gate (to keep out the “riot”). One of the players though to a driving-related feature and rams through the gate successfully (without damaging his car too much). They decide to head to one of the players apartments (he’s ex-military and a bit of a prepper too), as by now they’ve also seen enough to believe that something more than a riot is going on… Traffic is bad, like gridlock, but they refuse to leave the vehicle and even drive on sidewalks and through a park at various points to get home, despite a few “people” who assault the car at a particularly long stop, they just let them beat on it and keep their eyes ahead and the engine running. So after winding through backstreets and taking a few hours to get home, they take a breather, convert stress to trauma, barricade the doors and windowns and only then (a couple hours before sunrise) sleep. They wake in the late morning, turn on the TV and check social media and hear about violent clashes between police and citizens all over the city (which started the previous night and continued into the morning). Many shootings, which spurred actual riots, and all the traffic problems, hundreds of domestic violence calls all over the city, all which have the police overwhelmed. The governor has just announced he’s calling in the national guard. So it was a pretty good session, a little hectic between the new system and fast-paced development of the action, but what’s more, I got to see where the rubber meets the road with some of my home-rules/systems. My group loved the vanilla character creation, found 10 points to be a little restrictive, but grasped Features quite well, and my Starting Gear system was a big hit (they all used it to purchase normal stuff that they would logically have on them or in their car). They picked up on my Carry Capacity/Encumbrance system easily as well, and couldn’t believe the system didn’t “come with one”. The “Runner” zombies turned out to be pretty strong, which was good, made combat feel pretty dangerous. I guess not much else from my homebrew stuff came up yet, but so far so good! As for the system in general, it feels really low-powered, which is great for the type of game that it is, but I could tell my players were getting frustrated at how often they were taking Stress and how ineffectual they could be. This is kind of exciting to me though, as it means the steps I've taken to increase mechanical progression should pay off in the form of them eventually feeling like apocalypse badasses. P.S. thanks for the support Shubert!